It has allowed for the instantaneous transfer of information and insights on hockey players who, if not for the internet, would require you to be sitting in Herb Brooks Arena in Lake Placid, NY to see them and have an idea of how they are performing. Thanks to sites like FASTHockey, the annual USA World Jr. Evaluation camp is being streamed online, which gives part-time hockey guys who don’t have the ability to personally go to events like that the chance to see youngsters like Brandon Carlo, Anders Bjork, Jakob Forsbacka-Karlsson, Auston Matthews and so on. Of course- the moment you begin to share the observations of how they are doing, the inevitable questions come streaming in as eager, excited fans want to know what the analysts think. It’s only natural, and while I welcome the excitement and genuine enthusiasm, I also think this “shiny new toy” mentality contributes to the overall negativity that we see associated with prospects and players as they work their way up the ladder and gain more exposure either in the NHL or minor leagues. Some tend to be disappointed or let down when they finally see this elusive prospect species competing at the higher levels because they built them up to be something they aren’t based on Twitter comments or message boards. Beauty is often in the eye of the beholder, so one must be careful not to hype a player too much lest those on the outside build up unrealistic expectations and turn to negativity if they don’t pan out. Not to pick on folks- but a positive tweet about Carlo turned into some pretty substantial logic leaps on the part of a few eager followers. While Carlo shows a lot of promise because of his size, mobility and refined ability to defend, he’s been a Bruins prospect for a little more than a month and is still very much a work in progress. Let the kid develop without trying to rank him in the USA pecking order or project him to be the next big thing in Boston. I guess what I’m trying to say is- take it with a grain of salt. When you ask hypotheticals like- “Is this player going to be a future No.1?” The answer can be a resounding yes or no…but no matter who you’re getting that from it’s just a projection and it doesn’t mean anything until the player goes out and proves it. Some fans are generally positive, others more negative and yet some just try to play it down the fairway to be realistic. I go back to the old goaltending saw of not getting too high or too low after a game and finding the middle ground when it comes to following prospects. Instead of being in a rush to see them make the NHL, just let them develop on their respective timelines and evaluate them as they go. Some will live up to the hype, others won’t. 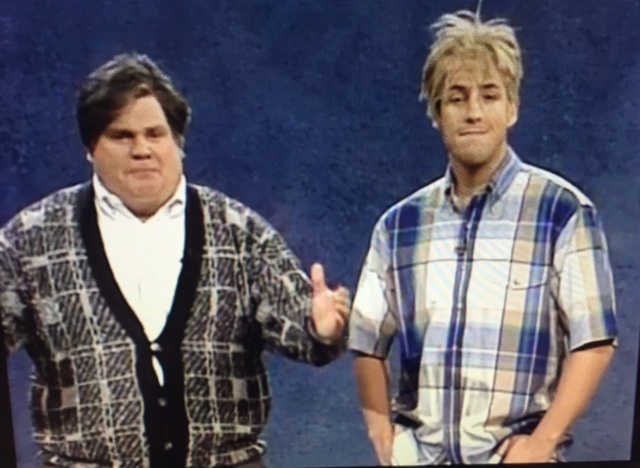 I’ll let Adam Sandler and Chris Farley explain what I mean with the old SNL Herlihy Boy House-Sitting Service skit. Just imagine that the Herlihy Boy is pleading with you not to get too wound up over these kids, and his assistant will drive home that message as only the late Farley could. Instead of asking you to let him sleep in your bed or move in, he’s just asking you to slow the roll a little bit.